Your bridesmaids’ flowers should co-ordinate with your bouquet but also compliment the colour that you have chosen for them to wear. 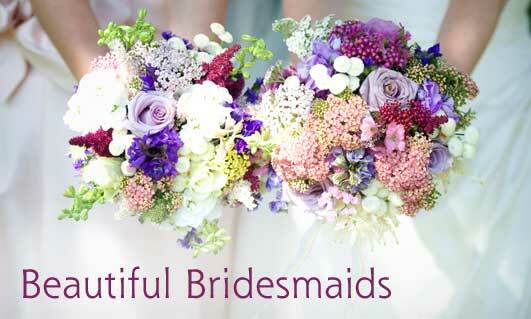 Adult bridesmaids can have a smaller version of the bride’s bouquet. These could have the same flowers/colours etc. or perhaps similar flowers with different colours. You have many options and we are here to guide you through these decisions. Alternatively bridesmaids can carry an individual flower, a handbag filled with flowers or a wrist corsage, beaded, plain or diamante. For your younger bridesmaids there are various options, of course we can create a small posy to coordinate with yours and the older bridesmaids bouquets, but if you are looking for something a little more unique maybe a flower wand, pomander or wrist corsage. On occasion some little ones are not keen on carrying anything, if this is so maybe we could provide them with fresh flowers for their hair.